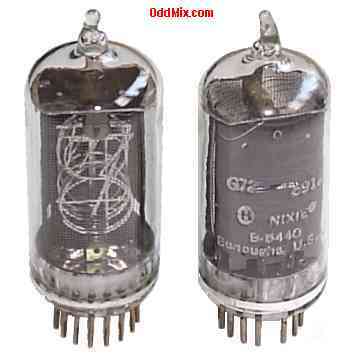 This is an original, vintage tubes by Burroughs B5440, B-5440 Nixie ultra-long life - 200,000 hrs. - numerical indicator tube made in 1969. It is has twelve cathodes, numbers 0-9 and two decimal points on either side of the numerals. This tube emits a bright neon red color. and require a 16-pin socket. Recommended operating voltage is 170 VDCmin, and 3 mA typical. These readout tubes were used in many early large scale computers, binary and digital counters equipments and special circuits. Excellent for antique instrument restoration projects or to set up a private tube museum. This is a NOS (New Old Stock) is (new) factory fresh, unused condition.